Two things that's are guarantees when summer rolls around are a)I will be forced to go to the beach, and b) I will be forced to go to a wedding. While wearing a suit to a beach is probably not a great idea, getting a new suit for Aunt Beru's wedding is. JoS. A. 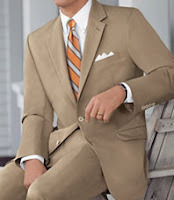 Bank is offering 50% OFF almost all suits through May 30! As an added incentive you'll also get two dress shirts and a silk tie FREE with purchase! Why stop there? Add to the collection with 60% OFF dress pants and 40-50% OFF all casual pants and shorts. There's a lot of discounts floating around, but you'll look pimp as you give your toast at the rehearsal dinner.